They protect your passport from normal wear and tear, and getting liquids spilled on them. If you use your passport a lot, then this can be very good thing. They help you quickly identify the passport in your luggage or bag. A dark blue cover doesn't always make itself known in a dark bag. They look super fashionable or sleek if that's what you're going for. They add extra travel organization. Add your important debit card, personal identification card, and passport while traveling. Add your 'INITIALS' or 'NAME' to your passport cover by clicking on 'CUSTOMIZE NOW' and adding your text in the 'NAMEBOX'. 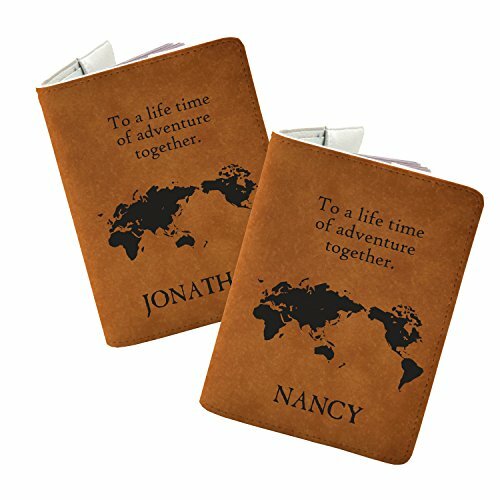 SCRATCH RESISTANT FAUX LEATHER: This passport is made from scratch resistant faux leather with a beautiful quality print that makes travel more fun. We wanted to create a passport cover that would last you for a lifetime. STURDY INTERIOR: The sturdy interior features a sleeve for your passport and two pockets to store your cards in. Interfaced and double stitched to last for years. Holds any standard US or EU size passport or item that is 3.5 by 5 inches. STAY STYLISH: As you travel around the world, keep your most important travel document stylish, shiny, and new with a custom passport holder. This lightweight accessory ensures your passport remains safe from harm while you carry your personal style wherever you go! 100% MONEY BACK GUARANTEE: For whatever reason, you don't love your Handmade Curious passport cover, just ship it back, and we'll refund every penny or replace it, if there's a problem. Get more style for less with this passport holder. If you have any questions about this product by Handmade Curious, contact us by completing and submitting the form below. If you are looking for a specif part number, please include it with your message.